Energy Management System (EnMS) exists to help organizations minimize operations which negatively affect the energy and helps to comply with laws, regulations and requirements to continually improve. We offer Energy Management System - ISO 50001:2018 Certification Consultancy, which helps organizations to design and implement an effective energy management system, documentation process and awareness/auditor training. During implementing EnMS, an initial review or gap analysis of the organization’s processes and products is recommended to assist in identifying all elements of the current operation, and if possible, future operations that may interact with the energy management system, energy baseline and energy review. The ISO 50001:2018 certification audit is done by certifying body auditors who verify implemented energy management system in the organization. The Energy management system documents for ISO 50001:2018 are designed to help global clients in preparing documentation. This EnMS documentation kit contains well-designed sample editable documents set, which is designed as per requirement of EnMS certification. Entire documents are written in editable MS Word format in plain English and many organizations have used it while preparing documentation for ISO 50001:2018 Certification. Any organization can easily modify the ISO 50001:2018 documents as per their requirement, and within four days their total documents with all necessary controls can be ready. ISO 50001:2018 Manual - Energy management system manual (10 Chapters and 3 Annexes). Energy System Procedures (14 Procedures). Standard Operating Procedures (13 SOPs). Blank sample formats for all the departments (31 sample formats). Templates of Energy Management Plans (4 filled Energy Management Plans). ISO 50001:2018 audit checklist for EnMS Certification (More than 500 questions). 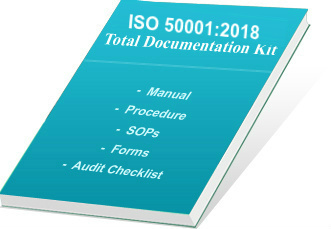 This globally used total ISO 50001:2018 documentation kit includes manual and mandatory procedures covering all the details, such as purpose, scope, responsibility, how procedure is followed as well as list of exhibits, reference documents and formats. The samples are given as a referral guide to follow for documentation while ISO 50001:2018 certification. Organizations are free to change the samples to suit their own requirements. The entire Energy Management System Documentation Kit is available in editable word format, thus, very easy to edit. Our many clients all over the world have used for the kit for EnMS certification and they have expressed total satisfaction. By using ISO 50001:2018 documents, you can save a lot of your precious time while preparing the EnMS documents. Our documents take care for all the sections and sub-sections that helps you in establishing better system. Our EnMS documentation kit enables you to change the contents and print as many copies as you need. Readymade sample templates reduce your time and cost of document preparation. The EnMS audit questionnaire helps in making perfect audit checklist. You will get a better control in your system, as our proven formats and templates are developed under the guidance of our experts. Our products are highly sold globally and used by many multinational companies. Our products have provided total customer satisfaction as well as value for money. This documentation kit has been verified and evaluated at various levels of our team and more than 1000 hours are spent in preparation of this kit. On successful completion of payment process, we provide username and password to download the product from our FTP server. Delivery of our products will be within 12 hours of payment confirmation by secure third party payment gateway. View free Demo of Documentation Kit and purchase it with secure online transaction with Paypal.com. Our products are used in more than 65 countries.